Let another know you were thinking of them! We are happy to announce that beautiful “notification of donation” cards will now be sent out to the family in whose honor a donation was made for a special occasion. This is a meaningful way to let someone know you were thinking of them and marked their occasion with a donation to Chabad of Cary. 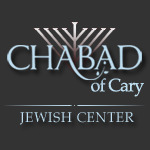 There are currently cards for “Mazel Tov”, “Wishing you a Speedy Recovery,” and “Our Condolences,” and the cards will be personalized and sent out by Chabad of Cary after receiving a donation for another's special occasion. When making a donation, please make sure to clearly mark the occasion as well as the address of the family to notify if they are not already in our database.